Société in Berlin is pleased to announce Petra Cortright’s participation at Art Basel Hong Kong 2017. Consisting of new works in the artist’s well known series of digital paintings, the showing represents Cortright’s ongoing exploration of digital space rendered materially. Cortright’s practice is largely computer-based. She’s in Adobe Photoshop working on these digital paintings for sessions lasting up to 12 hours. She builds layer upon layer, each time drawing a color, a texture, a shape, etc. from an existing image that she finds surfing Google Images or, more recently, Pinterest. Her hunting through endless online troves affects something like hypnosis and fosters a mode of artistic production that approaches stream of consciousness. Using some ‘brushes’ that she’s developed herself and others that she’s downloaded, Cortright assembles and manipulates ‘mother’ files – hundreds of discrete elements layered in infinitely interchangeable configurations. Each of Cortright’s paintings is made by printing a specific combination of layers on anodized aluminum, yielding a complex and vibrant pictorial surface. Some of the press that the works have received has noted their particularly widespread critical acclaim; other writers have been captivated by the way the works seem to deflect any claims on interiority – instead functioning as surfaces reflecting viewers’ own distorted perceptions. The paintings themselves often depict familiar elements: flowers, ripe fruit, skin, ribbons, and other decorative motifs. These Cortright weaves together with abstract gestures and hazy, colored shapes and gradient backgrounds. Many of the motifs that repeat in the paintings resist singular interpretation: A rose, for example, often appears throughout art history, but as an piece of iconography it has recently been reprised as shorthand for a more lascivious femininity. The allegorical meaning of the flower is not emptied out in Cortright’s digitally-cloned apparitions; rather, its pixelated abstraction creates an unsettling and amplified echo of the flower’s restrained use in traditional painting. Cortright’s appropriation of online imagery skirts a nascent feminist position surrounding the blending of critical and celebratory attitudes toward the Internet and its social horizons. Her replication of female bodies and tropes of femininity registers the crude nature of online representation – most evident in a 2015 video work made with screensavers of 3D strippers, which function almost as readymades. But by placing these bodies in the no-place of the green screen, Cortright also emphasizes their dependence on context. In an expansive video environment (the public venue of the exhibition superseding the covert private realm of the desktop), the writhing women become less private dancers, more an ambiguous and surreptitious ritual. 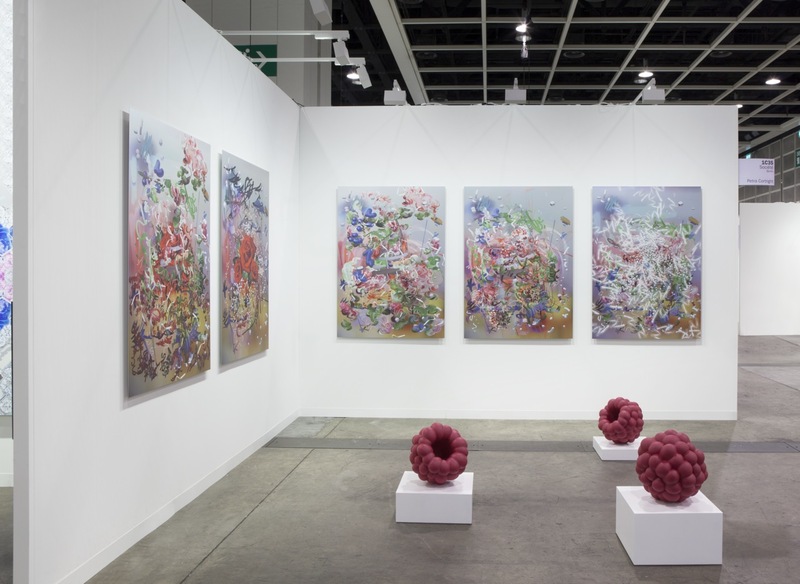 Alongside these panels, the booth will be installed with three large red raspberries – sculptures made from painted resin, polyurethane, and stainless steel. Produced using 3D modeling, the bright red raspberries are idealized forms, free of blemishes and irregularities. They look like they’ve been plucked straight from Cortright’s paintings, suddenly enlarged and endowed with three-dimensionality. The sculptures mark an ambitious exploration of new territory for an artist who first became known for her work in low-resolution streaming video. (This body of work has also evolved into an ongoing collaboration with fashion designer Stella McCartney, wherein Cortright poses in front of the camera similarly to how she’s been doing for over a decade – now wearing clothes sent to her by McCartney – and the results are circulated on social media and shown in stores worldwide). They also alter the scope of Cortright’s work profoundly. 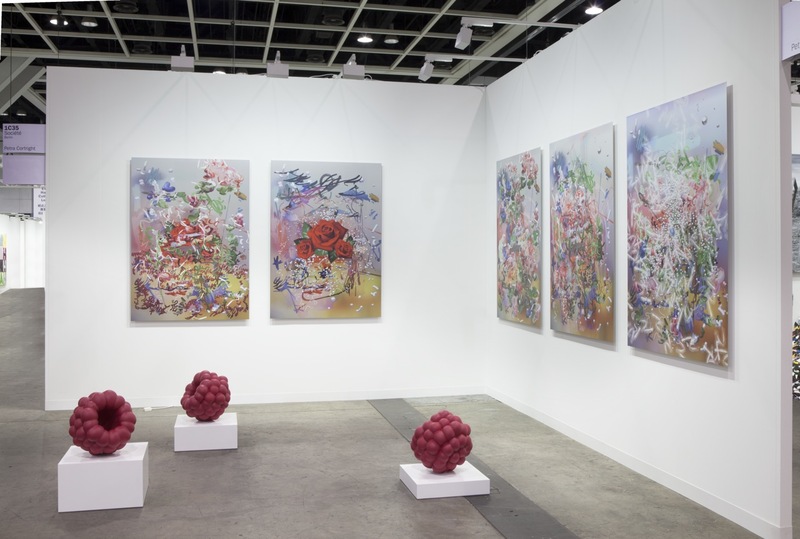 Société’s presentation at Art Basel Hong Kong consists of five works on anodized aluminum exemplifying Cortright’s unique method of digital painting. A single composition style repeats across the five panels, lending a strong sense of continuity to the works. In the booth, surrounded by a horizon of Corthright’s digital paintings and among the sculptures, visitors will have the feeling of having entered into the paintings’ endless digital landscapes, able to move freely among their many layers and elements and their loosened fields of meaning.